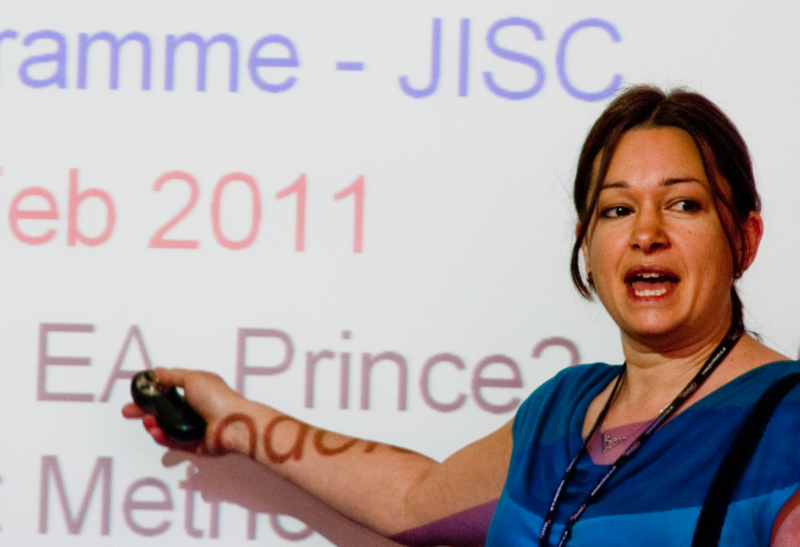 Nikki Rogers coordinates Web Futures activity at the I.L.R.T, University of Bristol (http://www.ilrt.bris.ac.uk/aboutus/staff/staffprofile/?search=nr8262). 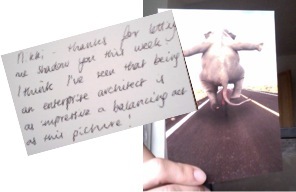 This post is part of a fond farewell to the University of Bristol as I have now finished a very enjoyable 4 years as Enterprise Architect there and I have just moved on to the role of Senior Enterprise Architect at the University down the road – UWE! UWE are building quite a significant EA capability as from this year, recruiting 3 EA’s in one go, led by an Assistant Director of IT dedicated wholly to Strategy and Enterprise Architecture. It was an opportunity I couldn’t turn down, but it was a difficult decision to leave the University of Bristol and I will really miss my fantastic colleagues there. IT Services at Bristol has recently recruited an excellent new CIO, Darrell Sturley, and I think he will help improve all aspects of IT considerably over the next few years. I will watch with interest! So, back to the real subject matter of this final post on my blog: what did we achieve through Enterprise Architecture in my fourth year in the role of Bristol’s EA? The two key achievements of this year were the successful launch of Master Data Governance at the University and the beginnings of a robust Technical Design Authority capability from within IT Services. 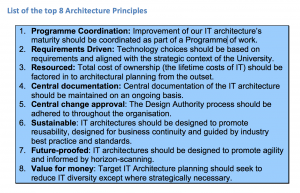 I’ve blogged quite a lot about Master Data Governance so I will focus here on the major aspects I put effort into to enable governance of our IT Architecture – through a Technical Design Authority. Technical Design Authority – how? To establish a Design Authority capability I focussed less on ‘who’ should be ‘the’ authority figure, saying yea or nay to all proposed IT implementations and standards, and instead on how such a design authority should behave at the University. Or, put another way, I believe the tools and processes are as important as the roles and governance structure put in place for the TDA. I designed a process (including a form for people to complete) through which all IT Change Proposals can be submitted – big or small, and whether originating from within IT Services or from elsewhere (for example through the University’s business case approval process). But I was particularly concerned with the appraisal process being based not on educated guesses, personal views, gut feelings, or even how well presented a proposal might be, but instead on a formal evaluation of the proposal against three things: 1. clearly specified IT Architecture Principles, 2. an understanding of all Architectural Dependencies, and 3. agreed Target Architectures. For this to work, documentation is needed. Over the year we created the following resources to use in the TDA process. It is interesting to note that the implications can often result in actions that need to be taken! Implication 3. is particularly relevant to the Design Authority decision making process. It is all too easy for, say, someone in the Server Infrastructure team or the Databases team, to come up with an architectural improvement without appreciating the knock on effect on the applications architecture. Or vice versa. For example, upgrading to the latest release of Oracle or SQL Server would seem to be a good idea, but clearly not if there are business applications which for ever reason aren’t yet compatible with it and which might stop functioning correctly. Similarly, one area of the University might think it a great idea to purchase a new Web Portal to surface content from their system on the Web without realising they are duplicating another Web view of information offered via an existing system – ultimately creating an ill-planned web experience for visitors to our website and potentially confusion all round. I have encountered many many examples of where a lack of an holistic understanding of our IT architecture has allowed for bad decision making. Then, after explaining to the Senior Management Team how valuable it is to be able to understand which architectural components are interrelated to others using a fuller-featured product, we were given the funding to purchase Bizzdesign Architect licenses. I explained that with good documentation we were also able to understand more about dependencies within our architecture generally – for example here I can show that our student administration system depends on a lot of infrastructure components; we can show very simply via the diagram that if the linux virtualisation platform supporting the web farm should fail, then the web client to the system (SITS:eVision) would fail too. However, the desktop client (SITS:Vision) would be unaffected so certain users would still be able to access the system via this. From a design authority point of view, it is valuable to use these architecture documents to ask pertinent questions about the potential for undesirable knock on effects that might occur if a particular IT change is approved. 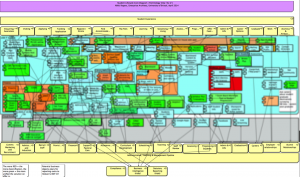 We could draw out target architectures using Archimate – these are useful. But I wanted something more accessible for those not familar with that language. I follow work by ITANA and decided to go with the Architecture Bricks approach they were evaluating at the time. 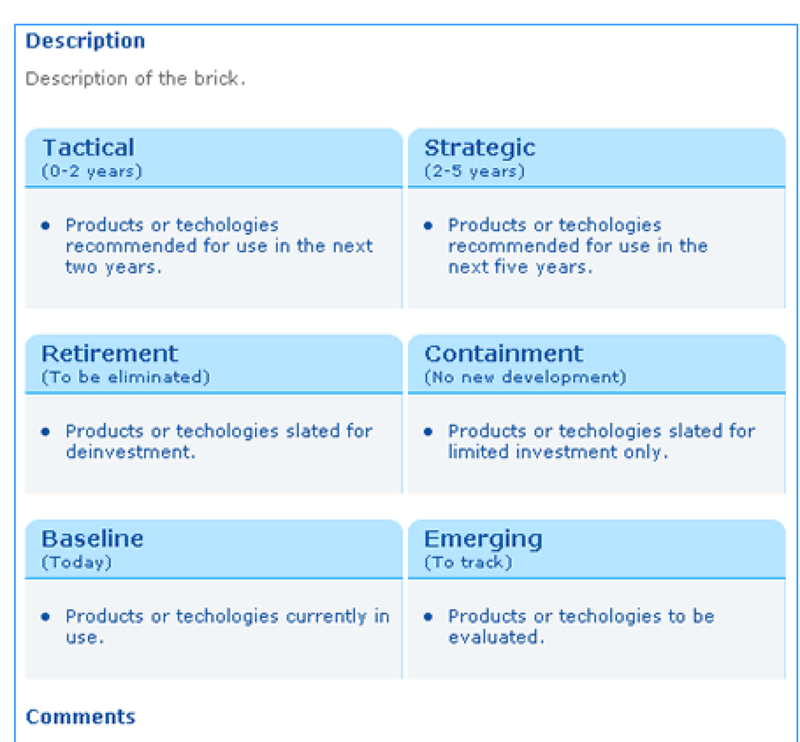 I ran a session with the IT Senior Management Team where we reviewed the 20 bricks together. It revealed key issues such as the number of retirement targets we had not planned for so far, and the number of – thus far uncoordinated – plans to move to Cloud services. From a Design Authority point of view, once they have been evaluated holistically and approved centrally, the Bricks become ‘the bible’. They describe future plans and containment/retirement targets. Therefore, for example, if a proposal is offered that attempts to build a new service on something we’ve marked as a retirement target we can have a fully informed conversation about whether to recommend against that. In this respect, the Design Authority isn’t functioning to try and stop all IT plans that run counter to the existing plans. Instead it is about making a clear and informed response about the implications to the organisation of deviating from the well thought out IT architecture plan. So that’s my top 3 contributions to the establishment of a Design Authority capability at the University. There are several other governance aspects of course, but as I said earlier, I felt it was key to reduce ambiguous decision-making by having a clear decision framework within which to operate first and foremost. Thank you for taking the time to read my blog and to all the colleagues from Bristol and around the sector that I’ve had the pleasure to work with in my role… I hope to work with many of you still as I stay in the HE sector in my new role! Bye for now! Earlier this year we launched a new team within IT Services: the Technical Architecture Virtual Team. I lead this team, reporting via the Assistant Director of IT Services for Services Development (the team’s Sponsor) to the Senior Management Team. The team is made up of a small number of technical experts within the department, representing key aspects of the University’s IT Architecture: Networks, Storage, Resilience, Applications, Middleware, Data Centre and Infrastructure. 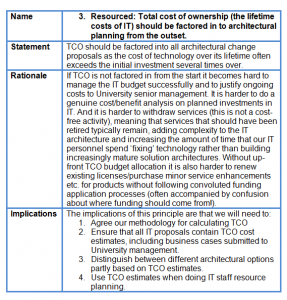 optimise the IT architecture holistically on an ongoing basis – i.e. create new architectural designs (taking advantage of cloud storage solutions or identifying opportunities for shared services at the sector level for example) based on a clear definition of the requirements that the IT applications architecture has on infrastructure. 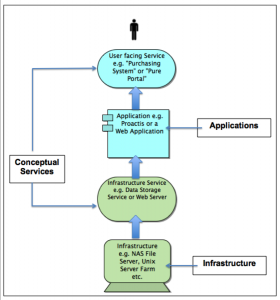 It is important to articulate the set of conceptual Applications (or “business”) services we need to support as well as the set of physical applications we have deployed in order to realise those conceptual services. 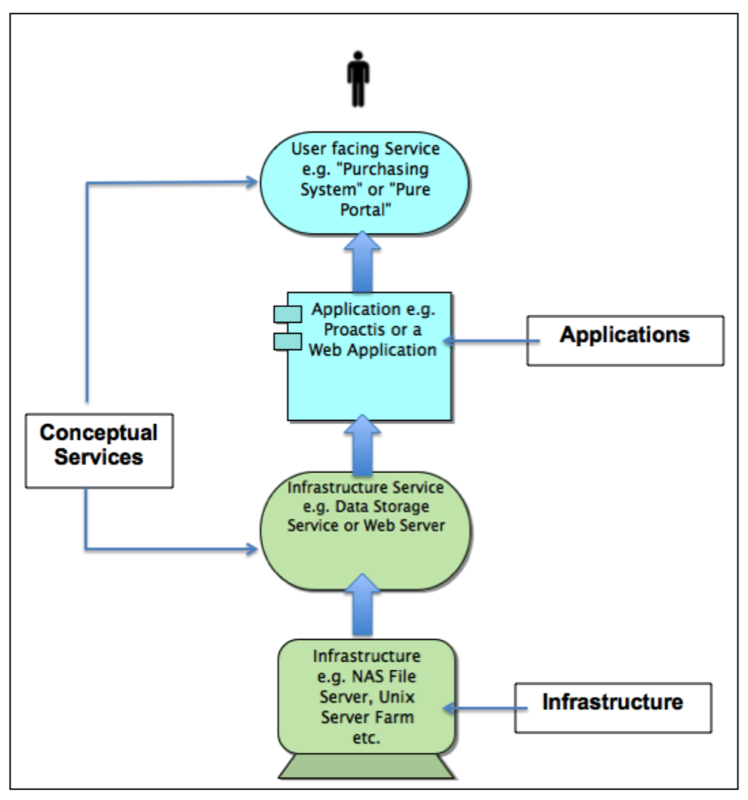 Similarly, it is important to articulate the set of conceptual Infrastructure services required to support the applications layer, as well as the physical implementation of them. 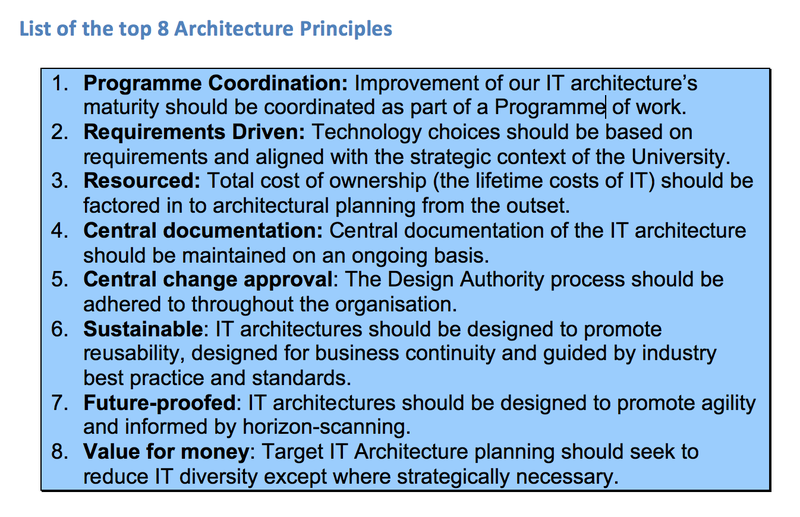 This is so we can assess the design of the entire IT architecture according to an holistic, requirements-driven approach rather than being driven purely by technology favouritism for example. The team is currently documenting (using the Archimate modelling standard) our architectures according to agreed conventions that work best for us. We will need to maintain this documentation on an ongoing basis for two key purposes: i) Troubleshooting: we are currently investigating how we can export realtime live configuration information from our virtualised infrastructure layers into this common visual format (and how to sync it with our Helpdesk application – we use a product called Topdesk – to assist IT first line and second line support), ii) Design: by being able to combine various Archimate models of our architecture into more holistic, architectural overviews, we aim to be able to focus on known weaknesses in our architecture and plan target architectures and the roadmap for change in an informed, aligned way. 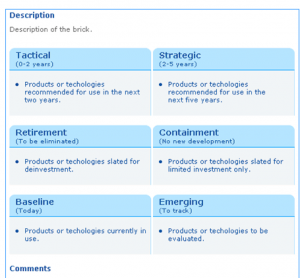 At the same time we are using a Bricks approach to evaluate individual Architecture Building Blocks (see for example https://enterprisearchitecture.nih.gov/Pages/WhatIsBrick.aspx ) in detail in order to evaluate our 2 year/5 year strategy for different areas of the architecture. The Archimate work then helps us to evaluate options for each Brick in relation to other Bricks, rather than in isolation. Through this we aim to avoid the somewhat silo’d ways of work that we have found can occur rather inevitably when we have separate Applications and Infrastructure teams. This diagram illustrates the positioning of the Technical Architecture Virtual Team’s work in relation to other Enterprise Architecture activities that I’ve written about elsewhere in this blog. It is also to show that all our work is done within the context of the organisation’s strategy and an understanding of the business architecture that IT Services needs to support at the University. Some time ago, at a UCISA Enterprise Architecture event, I discussed whether we needed a workshop for Higher Education (HE) sector technical architects to get together and share knowledge of Service Oriented Architecture (SOA). Whilst enthusiastic, colleagues expressed concern at the time that possibly the sector was too immature in this area for any individuals within it to be able to contribute to a worthwhile discussion. However I was not keen to host a vendor-led event as sometimes these can introduce an unhelpful level of product bias and not necessarily highlight the pitfalls to avoid when pursing a SOA roadmap in an HE institution. Since that time I bumped into several colleagues from other HE institutions at various events and began to realise that there was a lot more SOA activity going on around the sector than I’d maybe thought. The people I spoke to were very encouraging about the possibility of a SOA knowledge exchange and some obvious speakers began to emerge. 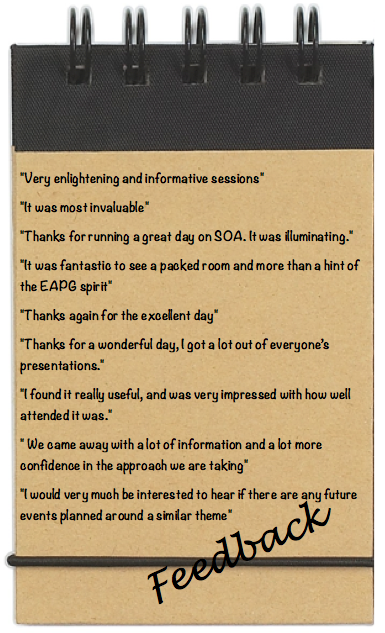 So I organised the SOA Knowledge Exchange at Bristol. I only had 40 places and they were filled within five days of advertising by UCISA and the JISC, clearly demonstrating that this is a hot topic for many of us. 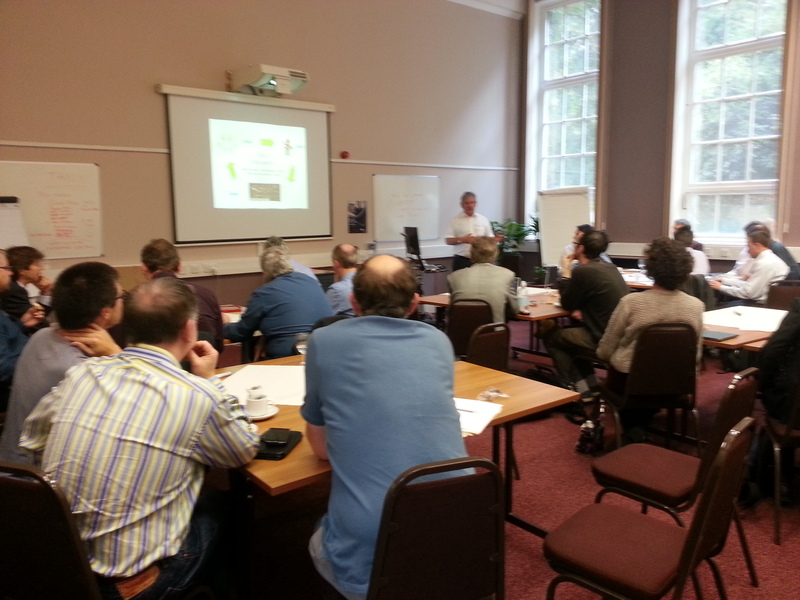 The workshop took place last month and here is a summary report of what went on. I presented the first session, briefly describing our SOA roadmap at Bristol (much of which is detailed elsewhere in this blog) and explaining how I managed to reach the ears of our senior level decision-making body last year. I talked about how, as Bristol’s Enterprise Architect, I am able to take an holistic, enterprise-wide approach, and to articulate to non-technical, key strategy-makers, the problems that our complicated, point-to-point architecture cause us. Taking a SOA appproach should reduce the costs of maintaining our data architecture, reduce data redundancy and duplication as well as save us the embarrassment of system breakages caused by data changes in a master system rippling in an uncontrolled way through the systems architecture and causing data failure. However, implementing a SOA solution will require investment and at Bristol we see the road to SOA maturity taking years not months. We are beginning with a year-long foundation stage. I talked about this and the work we are doing to document our current integration architecture: the interface catalogue and the enterprise data dictionary (I also talk about these elsewhere in this blog). Next up was Simon Bleasdale from Cardiff. He talked about how Cardiff is taking an iterative approach to enterprise application integration. Cardiff are building in-house skills through the creation of data integration and application integration teams and their approach is project-focussed. Simon described their range of data services so far developed using Restful Web Services via a combination of Grails and Mule. Having previously invested in IBM software, Cardiff are now conducting a review of this and plan to explore whether Talend or WSO2 would be a good future option for their University. They are committed to taking an agile, open source, simple and cost effective approach to data integration. Allister Homes from Lincoln followed Simon to describe their current technical architecture in terms of their early work on master data management (MDM) and deploying Enterprise Service Bus (ESB) technology using Microsoft Biztalk. He discussed how a combination of MDM and ESB is enabling Lincoln to distribute data via their Sharepoint and Customer Relationship Managment systems to a range of application services across the institution. He also read out a highly entertaining and very apt paragraph that Lincoln put in their SOA business case for senior management, likening the current experience of their digital communities to that of dwelling in a primitive, unintegrated town settlement and describing the vision of the future as analogous to a thriving ‘metropolis’ with properly integrated services. Martin Figg and Russel Gibson from Imperial gave a tour of the issues currently faced at their University and progress to date. Imperial have implemented SOA solutions for sharing HR organisation hierarchy data and research data with other IT systems and are now working on building data security into the architecture by integrating with their Authentication As A Service (AAAS) solution. They have worked on building SOA infrastructure in a standardised way to support generic error handling, reporting and resubmission. They are continuing to try and build strong SOA governance to stop the proliferation of point-to-point interfaces between systems and to promote the standardised reuse of data services to replace them. They have at least 6 skilled staff working in this area, with other staff in various supporting roles, including a SOA consultant to help answer particular queries. Some really interesting questions were raised in this presentation about the implementation of Enterprise Business Objects (EBO’s) and Enterprise Business Services (EBS’s), and the hard design decisions they’ve been facing in configuring the generic Oracle Business Suite to work best for their HE-specific purposes. Cal Racey brought us up to lunchtime with a presentation on Newcastle’s SOA and Institutional Data Management work to date. He described Newcastle’s institutional data feed service (IDFS) which delivers data to over 30 of their systems via 70 different feeds. This came out of the JISC funded IDMAPs project and is currently supported by the equivalent of two full-time staff. They are using Talend. 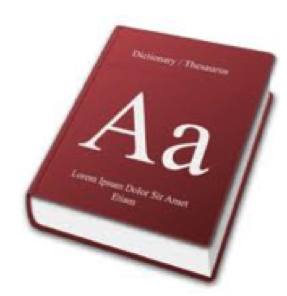 Cal advocates a light-touch data dictionary approach, avoiding going down rat holes with data structuring and modelling and also warns against the distractions of endless battles around whether to choose a SOAP versus REST approach, XML versus JSON data formats and so on. He also recommends continuously identifying where master data is held and what new master data an application produces. Cal described the importance of measuring the data problems right at the start so that it is possible to evidence the success of SOA-based solutions and thus build the case for continued SOA investment. David Rose opened our final speaker session, joined remotely by Chris Harding, Director For Interoperability at the Open Group. The pair gave a very useful, wider context to the whole day, talking about completed and current projects being undertaken by the SOA Work Group. Current projects include SOA for Business Technology, SOA Reference Architecture V2 and SOA Certification. Resources from completed projects can be found online (http://www.opengroup.org/). They also talked about Cloud readiness and the relevance of SOA to this. They went on to discuss whether the HE Sector could create a Reference Architecture that would evolve over time and enable both a language for conversations (and leveraging power) with suppliers as well as help individual universities to develop their SOA architectures. 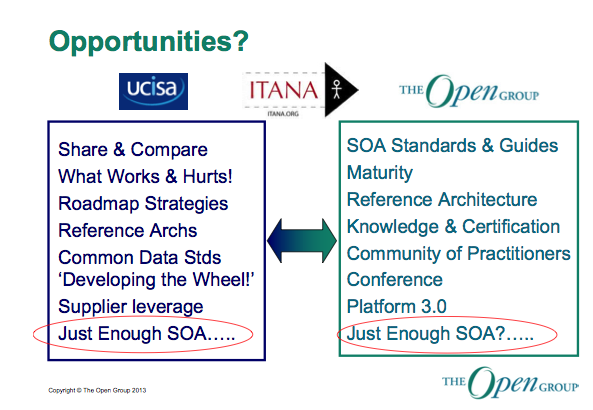 They finished with a thoughtful slide on the potential relationship between UCISA (with its Enterprise Architecture group), ITANA and the Open Group (shown above). And the conclusion? This event didn’t feel like the blind leading the blind by any means and the feedback has been excellent (a selection of which I’ve recorded here). If we can keep up the momentum I think something very constructive could come from this initial effort to collaborate. Hopefully we can work on a reference architecture for our sector, share emerging SOA design patterns and perhaps we can begin to influence key vendors by clearly specifying our common data architecture requirements… Many thanks again to all the speakers and for the great input from those who joined us as participants. It was a very enjoyable day! We are holding a workshop in Bristol this month for Enterprise Architects, Technical Architects or those in similar roles at Universities in the UK. The general aim of the event is to gather and discuss the SOA roadmap strategies we are developing within our institutions, to share success stories and to alert others to potential pitfalls along the SOA adoption route. 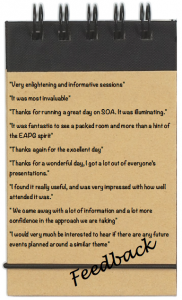 This is not an introduction to SOA, but a chance to share real experiences of adopting a SOA approach within an HE institution. There will be presentations and discussions throughout the day, mostly from colleagues working on SOA initiatives in a UK University setting, but also with contributions from Jim Phelps of the ITANA group (serving HE institutions in the USA) and Chris Harding of The Open Group (dedicated to developing global IT Standards). 2pm Talk 6: Chris Harding and David Rose from the Open Group: Emerging Open Standards in SOA and the new ‘Open Platform 3.0’ area. 3pm: Coffee and Tea, Open discussion, Are there steps we can take at HE Sector level for example to develop common data standards and encourage IT Suppliers to comply with SOA approaches that we will require? (noting the Higher Education Data & Information Improvement Programme (HEDIIP which is developing a Higher Education Data Language) and its potential relationship to the growing number of SOA initiatives in UK Universities). 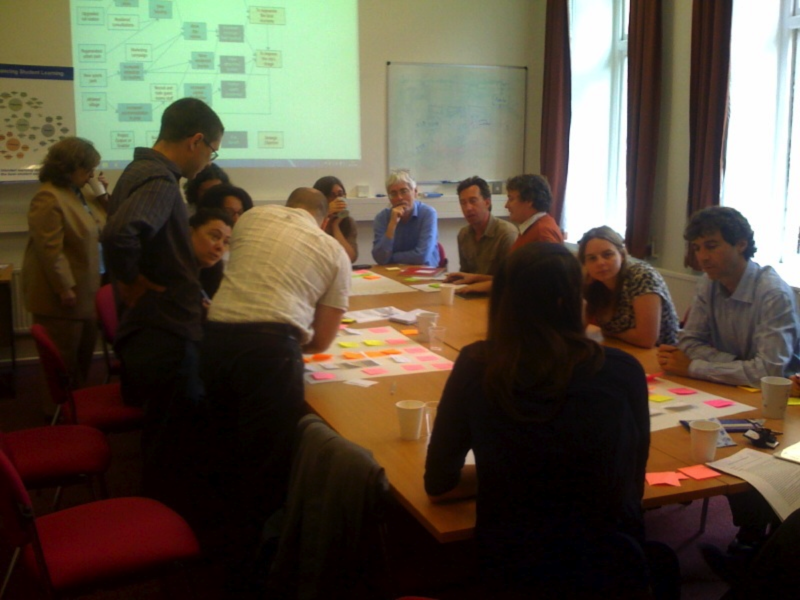 Raising the profile of EA: a two-hour workshop with the Portfolio Executive (http://www.bris.ac.uk/planning/programmesandprojects/portfolioexecutive/). This senior decision-making group within the University were interested to know more about Enterprise Architecture, so I ran a 2-hour workshop with them last summer. Enterprise Architecture covers a very large range of concepts so it is hard of course to hand-pick the right things to discuss in a session like this, especially where the audience is largely non-technical. 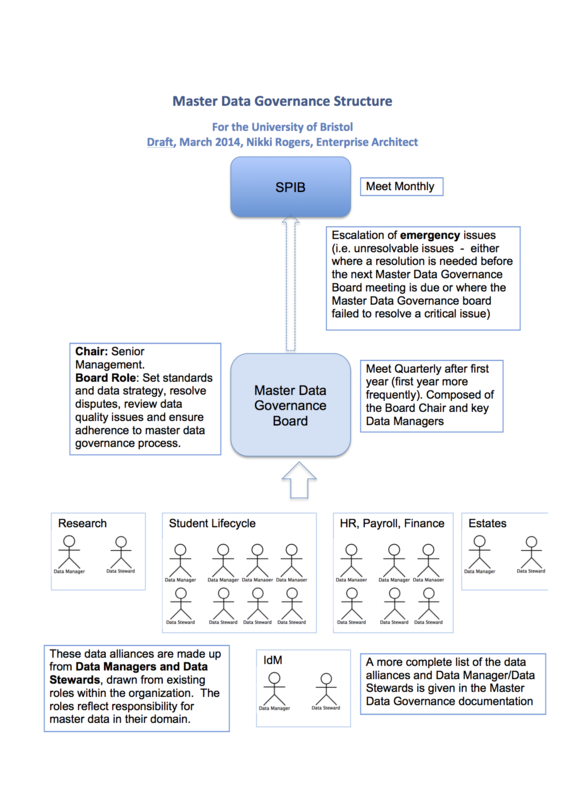 I decided to concentrate on two things: firstly on how an Enterprise Architect needs a clear University strategic framework within which to work and secondly on the importance of a well-designed data architecture at Bristol. The workshop went very well indeed; the first part resulted in follow-on Benefits Mapping work – I have blogged about that here: http://enterprisearchitect.blogs.bristol.ac.uk/category/benefits-maps/ and the second part resulted in high-level recognition and endorsement of the master data management strategy I launched at Bristol – see http://coredataintegration.isys.bris.ac.uk/2012/10/22/explaining-the-importance-of-a-good-data-integration-architecture-to-senior-management/ for how I introduced this concept to the group. 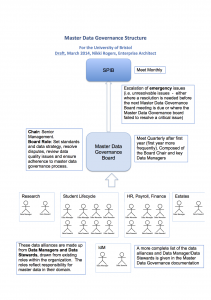 Embedding EA within the Governance Structure at Bristol. One problem I wanted to tackle was that of how to ensure that EA is a formal consideration whenever new IT-related projects are proposed at Bristol, whether that should involve in-house IT development or the procurement of third-party systems. 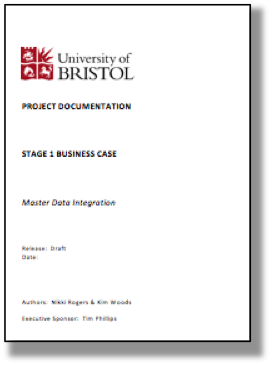 Until this second year, EA was being acknowledged as valuable at Bristol, but there was no place in the project approval process at which the Enterprise Architect could make a clear recommendation based on an appraisal of some new project’s fit with Bristol’s business architecture, information architecture, and technical architecture. When I started in my role I was invited to be part of a group called the System Programme Managers Group (SPMG) which met monthly to review current and proposed projects, and which was comprised of managers leading various University programmes (IT, Education, Planning etc). I ran a workshop with this group entitled “Capacity for Change” and I talked about how we should review potential projects in terms of what priority they should have in the already packed project portfolio that the University was funding. This, in combination with some senior level initiatives culminated in the renaming of the SPMG to the “Portfolio Management Group” (PMG). Its new remit is now to support the higher level Portfolio Executive group more directly by making recommendations on any new project’s fit with the strategic priorities of the University. We have aligned the strategic priorities with the benefits mapping work I mention above, and each new business case is now submitted with a PMG recommendation, describing whether we have existing resources to support the proposed project, its priority level, and a statement of its fit with the enterprise architecture – hurray! So, this is not to say that Enterprise Architecture considerations now dictate decision-making, just that it has become formally recognised as part of the project approval governance process; a positive step forward. Step 1. 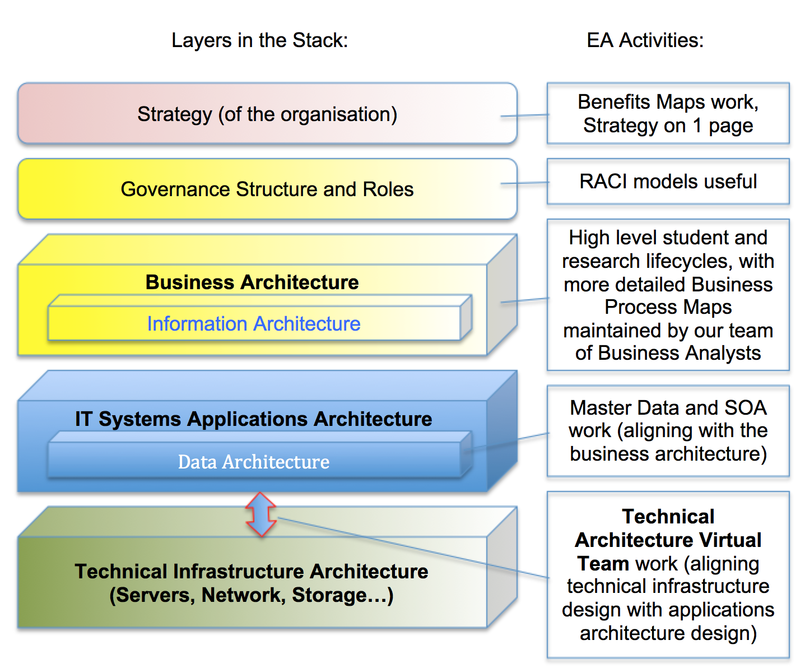 Make the initial business case for Service Oriented Architecture (SOA) (even if it is not explicitly called ‘SOA’ at this stage) to achieve senior level understanding of the importance of a good data architecture and why investment in this apparently invisible middleware layer will bring benefit to the institution. Step 2. Complete the data dictionary and the interface catalogue to at least 80% for all master data system integrations. 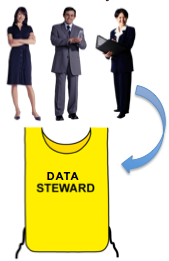 Step 3: Introduce data governance. Step 4: Analyse the interface catalogue and develop a logical data model from the data dictionary. Our interface catalogue already reveals the high percentage of point to point interfaces that replicate very similar data synchronisation tasks between IT systems. We can at this point make recommendations regarding how we can reduce this percentage dramatically and refine the integrations into a minimal number of key data services to share master data across the systems that require it. 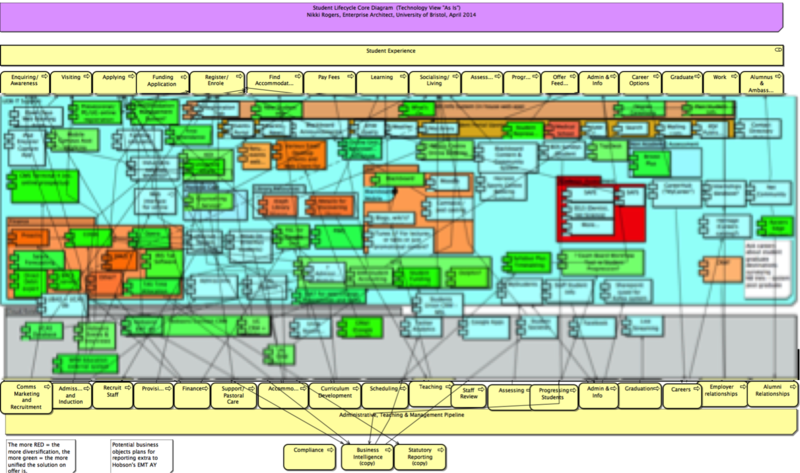 This is where we relate SOA planning to the business architecture of the University, with an appreciation of how data is used across the student and research lifecycles. This step therefore requires business analysis as well as technical systems analysis. The benefit of doing it is that we are able to describe more specifically the cost-savings and agility that the University stands to gain if it invests in consistently applied SOA technology. 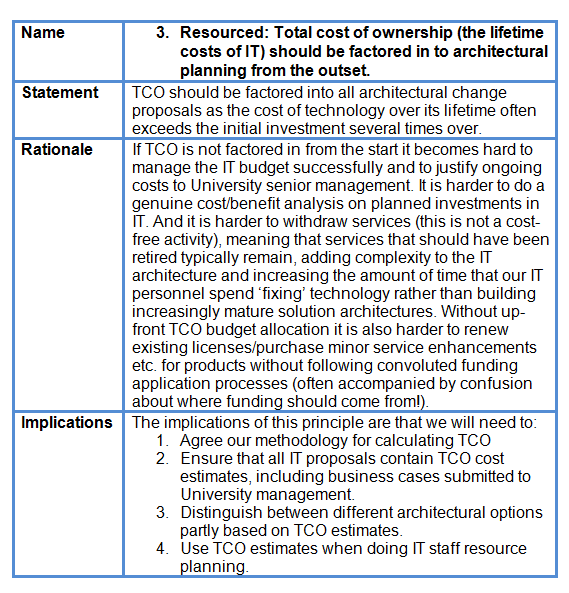 We can note that Gartner’s research demonstrated that 92% of the Total Cost of Ownership – http://www.gartner.com/it-glossary/total-cost-of-ownership-tco/ – of an average IT application, based on 15 years of use, is incurred after the implementation project has finished. A significant part of those costs will be concerned with maintaining the application’s seamless integration within the organisation’s application architecture, so by simplifying this we should save costs over time. Naturally, the other purpose of doing this step is so that we can analyse the “As Is” architecture and design the “To Be” architecture – a precursor for step 5. Step 5: Adopt a SOA technology solution, train IT developers to use it. 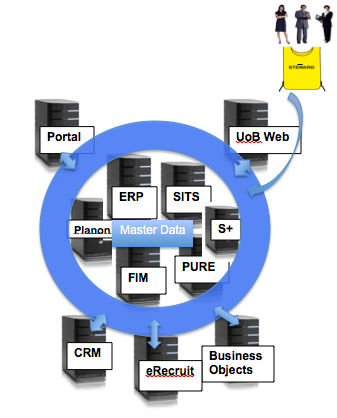 Cheaper, less complex to maintain, standardized master data integration architecture (blue ring). Step 6: Train our IT developers and Business Analysts to work together using a standard set of skills and tools based around BPEL, BPM etc. At this point we expect to reach the level of SOA sophistication where we have the ability to orchestrate and optimize end to end processes that share and manipulate data, creating efficiencies and business agility across the institution. Suffice it to say, we are some years off Step 6! We are currently working on steps 2-4 above. This Autumn I am running a knowledge exchange workshop for HEI’s working on SOA roadmaps to gather and compare and contrast their plans, successes and lessons learned to date. If you are interested in coming, please contact me directly. I have been to a couple of JISC-sponsored events previously at which benefits maps were presented. It was claimed that they can be useful in helping a University to think about return on investment (ROI) in terms of strategic planning. So I suggested benefits maps as being of potential use when I ran an Enterprise Architecture-focussed workshop with the University’s decision-making body (the Portfolio Executive) in a workshop earlier this year. The group agreed to trial the approach and we have been doing quite a lot of work with this tool since then. I’ll give a brief account of this here. I introduced benefits maps as a tool to assist us as we continue on the journey towards the desirable position of strategic maturity. 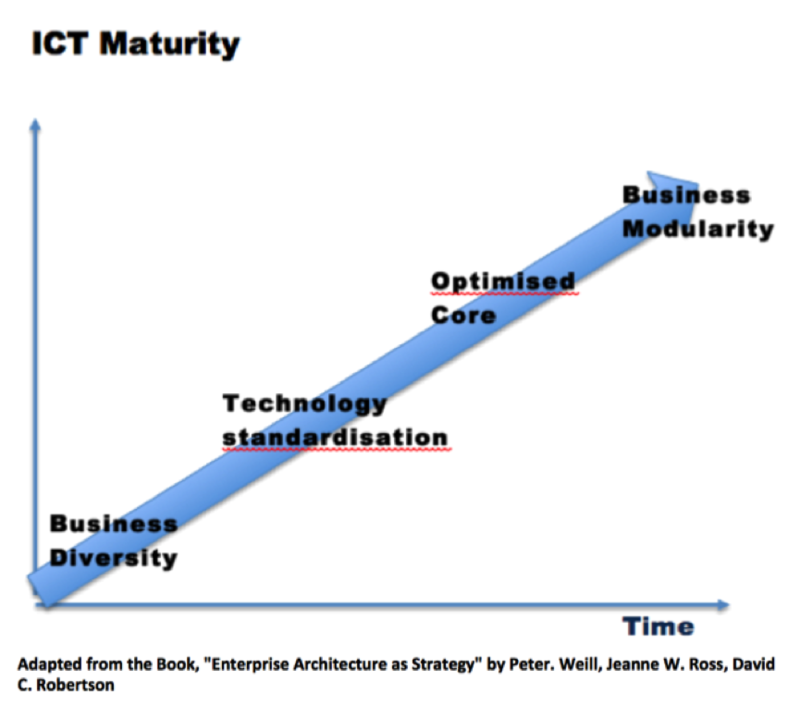 I am sure there are many definitions of what strategic maturity actually is. My version goes something like this: Strategic maturity is a good position for the University to aim for, a position in which the University’s complex map of initiatives, programmes and projects (the agents of change) are aligned to common strategic aims and objectives. A position in which planned changes (in business processes, culture, IT systems, buildings, governance and so on) are made with a clear understanding of the benefits that they are supposed to deliver, and with the capability to communicate intention holistically and to perform benefits realisation (i.e. to know whether benefits and return on investment are truly being delivered, and if not, then what to do about it). At levels of senior governance there should be clarity and consensus around high level strategic objectives and an ability to state them concisely. Ultimately, to achieve this level of strategic maturity should not only mean that the University performs more efficiently and confidently, but also that it is also able to respond in an agile way to the need for ‘business’ change at any time and thus be very successful at maintaining a competitive edge in all key areas. I discussed with the portfolio executive the nature of the strategic framework within which the University of Bristol operates and whether “Strategy on one page” would be an achievable goal. We have lots of excellent, lengthy strategy documents at the University – the overarching one being the Vision and Strategy document at http://www.bris.ac.uk/university/vision/ – but sometimes I have found it hard to interlink them easily in such a way that it is easy for me, as Enterprise Architect, to help align IT Services planning with strategy (see Section 1 of the JISC Strategic ICT Toolkit for a nice articulation of why organisations seek this alignment: http://www.nottingham.ac.uk/gradschool/sict/toolkit/importance). We haven’t decided on a format for strategy-on-one-page yet, but there are some interesting examples around, see for example the Sorbonne University sample at http://www.sorbonne-university.com/about-sorbonne-university/challenges/strategic-framework. However, we have been trying the benefits maps approach to elucidating the logic of our strategy and to help pave the way towards benefits realisation. There are different approaches to modelling with benefits maps, but this one, with the five key concepts of project/output, business change, intermediate benefit, end benefit and strategic objective is the one I’m currently finding the most useful. We are now in the process of producing three Benefits Maps: one for the Research area, one for the Education area and one for Support Areas that includes Administration, IT, and Finance. Our initial benefits maps demonstrate a mapping of all our currently planned project outputs and enablers to strategic objectives on a single page per benefits map. This gives us a part-visual impression of the current – “As Is” – state of our strategically focussed activity, based on the current projects portfolio. The next step considers gaps and opportunities and whether we can produce a “To Be” benefits map for each area that demonstrates what the project portfolio would ideally look like in order to fully meet prioritised strategic objectives. Using this methodology may inspire a reprioritisation of projects, or even a coordinated call for new projects, in order to help us to roadmap the way to the envisaged future position. Although we are producing three separate benefits maps for the different areas, we hope to do some interesting work in bringing them together into a simple, unified view of the University’s strategic priorities and supporting activities. Meanwhile, our Director of Planning is undertaking some work developing comprehensive benefits realisation plans that map to the end benefits in our benefits maps. These describe how we will measure the benefits monitored on an on-going basis as the University continues to strive to deliver on vision and strategy. She is using a balance score card approach. And where “problems” might show up over time (i.e. whereever the measures indicate that in fact we’re not seeing the progress we’d predicted in some area) we hope to be able to use the benefits maps to inform discussions of why benefits are not being realised and to help determine whether we need to action plan our way back on course or whether to leave things as they are (or perhaps even where to cease projects that are not delivering the intended benefits). To explain, take a look at this example excerpt from an education-focussed benefits map: On the left hand side we list the lecture capture project which we show as delivering the interim benefit “more learning resources online”, which in turn leads to the interim benefit “Greater quality and consistency of the student learning experience”. This feeds into an end benefit (that we are actively measuring via a number of mechanisms articulated outside of the benefits map): “More Positive Student Feedback”. Notice as well the business change shown as feeding to the interim benefit about more learning resources online: “Culture change to encourage academics to make more use of online opportunities for enriching teaching and learning”.If we should find out that over time we are not getting positive student feedback about the learning resources available to them online then we can use the benefits map as a discussion tool in trying to figure out why. For example we might find that the technology deployed by the lecture capture project was not fit for purpose. Or we might find that in fact it was perfect for use but instead academic culture had not adapted sufficiently (some academics may think that by recording all their lectures they’ll actually put off large numbers of students from bothering to turn up to the physical lecture!). Naturally we could take action to improve the situation given either scenario. Of course this is not an exact science and several other outputs are feeding into there being more learning resources online. But this benefits maps approach does give us more focus to our discussions. Encourage concise language – restrict benefits maps to one page (you can always extend the description of concepts in the benefits maps by cross-referencing them to accompanying papers, say). 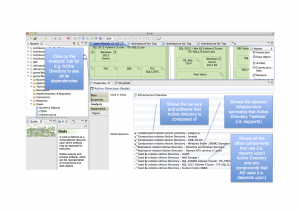 Review benefits maps, extrapolate critical pathways in them for further discussion and keep them regularly updated. 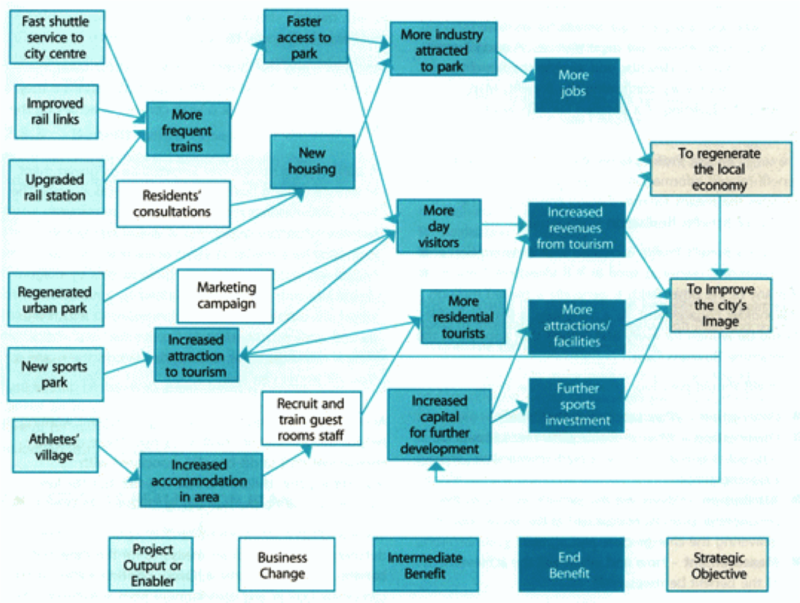 And what of the benefits of benefits maps? !